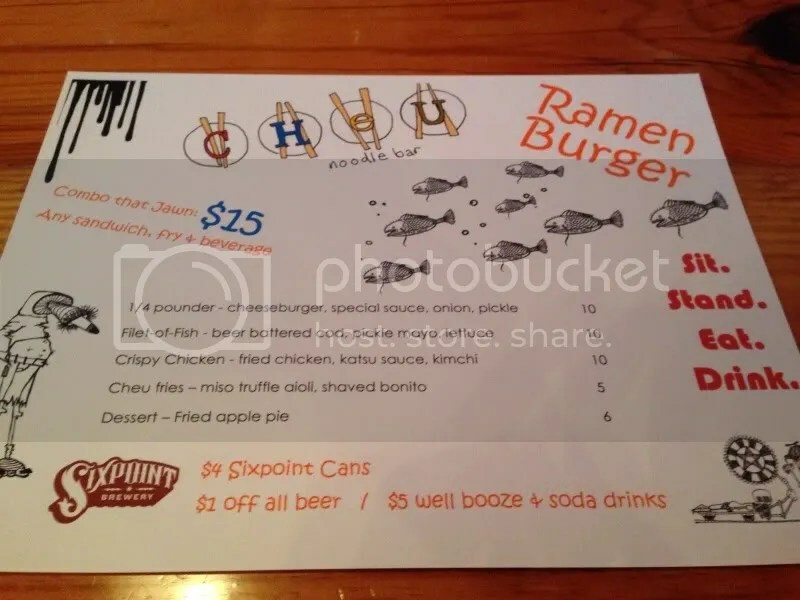 Unless you’ve been living under a rock this past Summer (which is entirely possible, and I’m not here to judge), the Ramen Burger has been sweeping the food scene coast to coast. 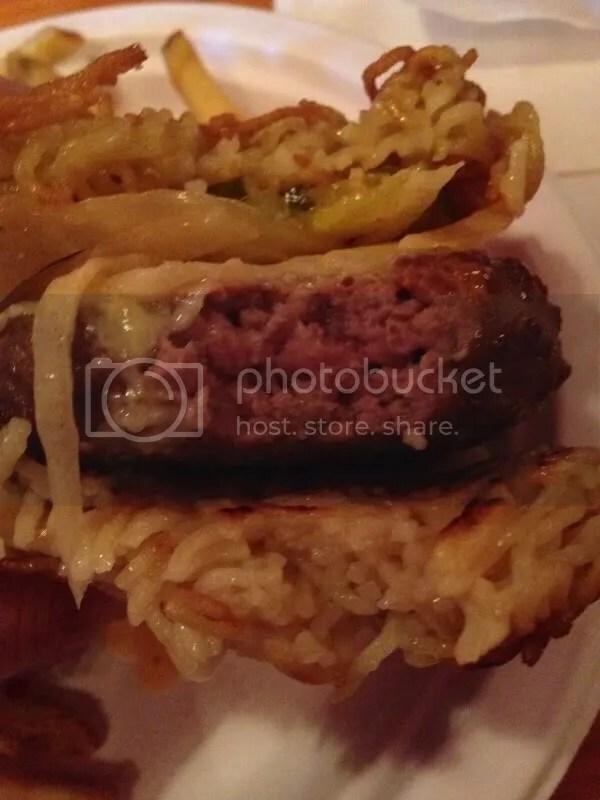 Yes, a burger sandwiched between two “buns” made from what you ate that entire last semester of college because you ran out of money for groceries. And who better to bring the trend to Philly than the awesome gang over at Cheu Noodle Bar! For one night only, the noodle joint was cranking out McD’s inspired versions of the hot, new food craze, including a Tonkatsu (fried chicken) patty and their own Cheu-ized version of the Filet O’ Fish. I might be more inclined to eat at a fast food place if I could request to “combo that jawn”. 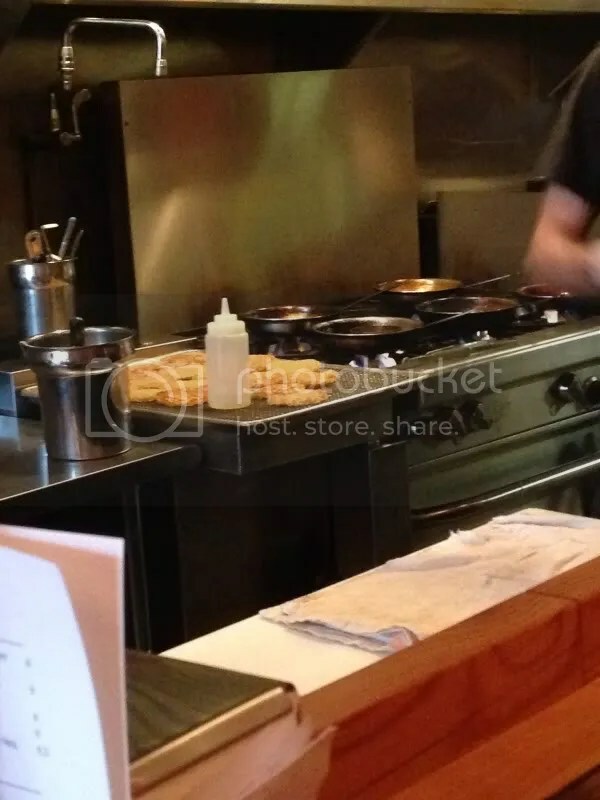 All the ramen buns were being fried up on the fly, so naturally there was a bit of a wait. But that’s what we’re all here for, right? Since the pop-up started at 6, I decided to try and get there as early as possible in case a line started to form. 5:30 – no one was there yet, so I felt a little weird just hanging around outside by myself and sat across the street in a park like a creeper, keeping an eye out. Finally, a small group started to gather around 5:45 and at 5:57, we were allowed inside. I took a seat at the counter, I placed my order, and by some miracle of the Ramen Burger gods (or maybe just the fact that I was one of the few solo diners), I got served the very first ramen burger of the night! View from the top: The noodles look so cool! The burger looked AMAZING! The ramen bun held together well enough after the first bite, but began to unravel as I continued eating. It was messy, but probably the best kind of messy you could ask for. The burger itself was delicious and juicy, cooked perfectly medium. The homemade “special sauce” gave it a nice flavor. And while I don’t normally care for raw onions, they were just thin enough that the taste didn’t bother me. Plus, how can you have a “Big Mac” without the onions? The fries were garnished with some bonito flakes; they were supposed to have been drizzled with a miso truffle sauce, but I didn’t mind since I prefer to dip then to have something coating my fries (plus I just dipped them in the leftover special sauce). 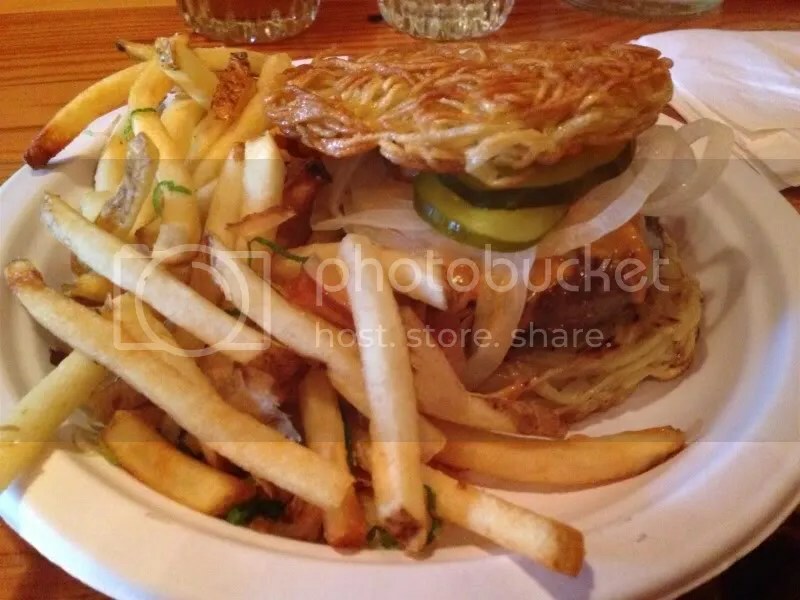 Ramen Burger cross-section: So many layers! An older gentleman was seated next to me at the counter and had actually wandered into the pop-up purely by accident. He had heard it was a noodle place, so he was surprised by the strange burger happenings of the evening. I told him about what was going on, and that he should brag to all his friends tomorrow that he went to one of the hottest food events of the year. His Filet O’ Fish on ramen bun was arriving just as I was leaving, so I hope he enjoyed himself! I heard they ran out of food just around 9 o’clock, which is not surprising at all judging by the crowd of people waiting outside when I left. As for the ramen burger itself, I’m not sure if it would be something that I would eat regularly, but it was definitely fun to try. So what’s next for whacky food concoctions that cause people to wait in ridiculous long lines for hours on end? 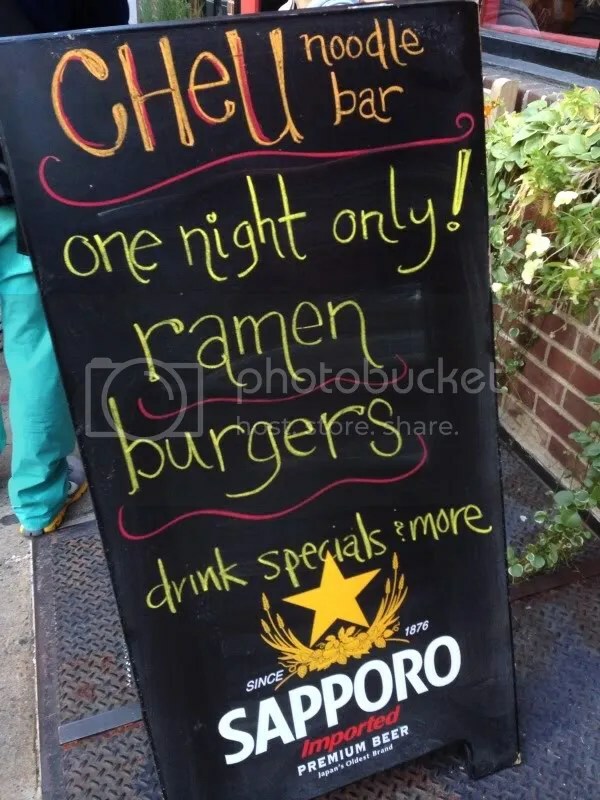 Will someone put a cronut between two ramen buns? Guess we’ll just have to wait and see! 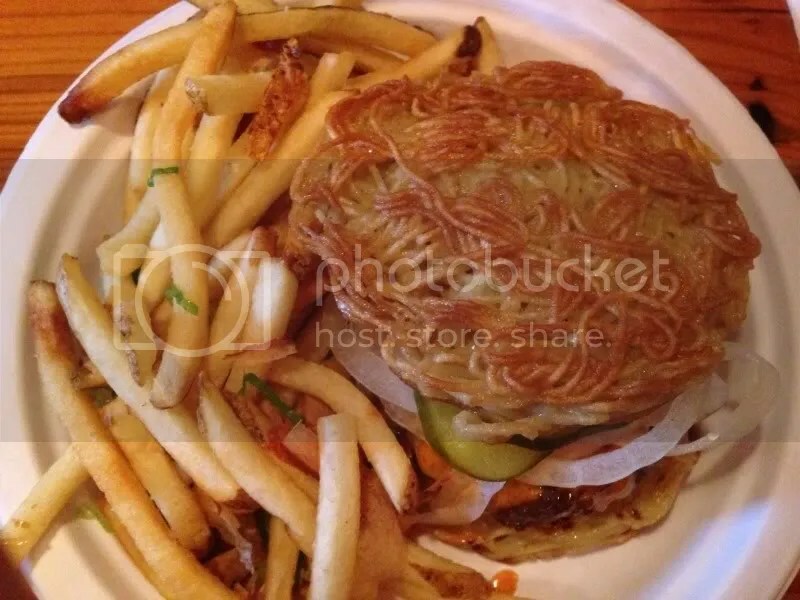 Posted in buns, burger, Cheu Noodle, Combo that Jawn, McCheu, Noodle bar, philadelphia, philly, pickles, Pop-Up, Ramen Burger. Bookmark the permalink.